My friend Lorene and I seem to have some sort of book kinship. We usually love most of the same books, such as Ella Enchanted and Frindle. Well, I decided that I would test to see if her husband Mark and I like the same books. I can’t say for sure after just one book recommendations but it looks like the kinship runs in the family. I often smile at jokes in book but Diary of a Wimpy Kid made me laugh out loud in places. I loved all the little crazy cartoons to help describe the story. 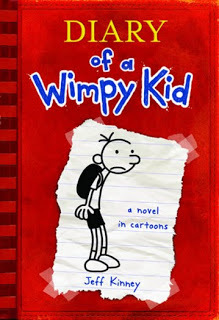 I think all of us have parts of that wimpy kid in us and that is what makes it so easy to relate to him and laugh at him. Since this book takes place in middle school and Seth teaches middle school, I would often read him parts of the book because it sounded like some of the crazy stories he has told me about his students. Sometimes I can’t believe that middle school students are really that crazy but Seth is always there to reassure me that they are. This book is a quick read and has many pictures to illustrate its point. If you need a good laugh and are in the mood for middle school humor I would definitely recommend it. Thanks for the __________. It looks really great on my ____________. All my friends wish they had their own __________.